ALPHACOOL RGBW controller with remote control: the interface for the Alphacool RGB family. All Alphacool RBG products offer fantastic and unique ways to illuminate your PC and its components. The new Alphacool RGBW controller allows you to control the three colour channels plus a pure white light channel, giving you complete control. With the remote control, individual colours, different modes as well as their display speed can be changed easily. The Alphacool RGBW controller is powered by a 4-pin molex male connector with 12v input, like you would find in an internal power supply. 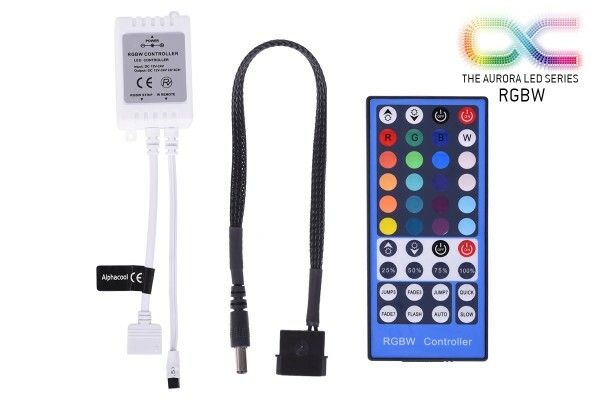 A supplied infrared sensor cable ensures the connectivity between the remote control and the Alphacool RGBW controller. The 4-pin RGB output is intended to work with the Alphacool RGB splitter cable (1013984 or 1013985), and can connect to up to three splitter cables. There is a maximum limit of 12amps on the controller. There is a limit of a maximum of 2amps per colour channel. When planning, please compare the current consumption of the RGB products in use and ensure you don’t overload the channel. The remote control allows you to change settings in real time and the Alphacool RGBW controller will store the settings until you change them again with the remote control. Of course, these settings are not lost when the computer is switched off and are available again at the next system start.